I have not been able to get online as much since I have been here in Austria. I’ve written this post ahead of time, and am now standing on a sidewalk in the sun, computer perched on a mailbox, stealing wirelss internet (along with other athletes J ) from a near by business. Its about 3:30 am your time - hopefully you are all fast asleep. Anyways, another week and another set of World Cups have gone by. These races were a bit more challenging than in Sweden and I did not fair as well in the results as I had hoped. In the first Sprint race, I was very nervous and had to spend a lot of the race trying to stay relaxed. I missed one target in prone and 3 more in standing. Hochfilzen’s range is new to me, and I have not quite adjusted to the uphill approach and the tricky wind. Despite my shooting, I was happier with my skiing on a course that is very technical. What that means is that in order to smoothly transition from the flats to the hills, you really need to pay attention to the change in snow conditions, grade of the hill, which direction the trail is turning, and whether the trail is canted to the left or right and then respond with the correct technique* that will carry your speed and momentum through the different sections of the course. *There are 3 main skate techniques: V2 for gradual uphills and flat terrain, V2 alternate for flat terrain and V1 for uphills. I really like being able to “read” the trail and making the very important decisions about which technique, variation or combinations of, that will be the most efficient way to travel over the snow. Looking up to the main uphill on the 2km relay course, you can see a skier from Kazakstan in the V1 technique on the spectator lined trail. The second race of the week was the Women’s 4x6km Relay. Each leg shoots twice, prone and standing. The catch is that you get three extra bullets (which are stored in a special place on everyone’s rifle) to be able to hit all of your shots. I lead the US’s relay team and came into the first shooting stage in 8th place (out of 20). Unfortunately, I was not able to adapt to a tricky wind and missed three targets. I felt much better skiing, and confident that I can ski with this elite level of women. However, there is a bit of magic to a relay; it is not jus about one person, it is about all four of us representing the US. With altruism mixed in, you can find that extra bit of strength that will help you get up a hill faster and push beyond your limits, because if you do, you give your teammate a better postion to start in. On the final uphill I pushed as best as I could towards the exchange zone where I tagged off to my teammate, Lanny Barnes, who is one of the best shooters on the entire World Cup. My team skied and shot well, and brought our result back up to 16th place. We are excited, because on Sunday we will be able to do it again, but with a better understanding of the course, the range and what we need to do together as a team to reach a better result for US women. Ukraine entering the tunnel towards the range and a cheerful and exhuberant crowd abher. The fans are into it here. They stand with flags, bells and start lists in hand, cheering genuinely for every racer, no matter which country. They even look for your name on the start list - I was quite suprised to being skiing uphill and have a spectator yell, 'Go Haley Go' - in perfect English! I have been thinking about all of you and hope all is well. You must be on Christmas break soon? 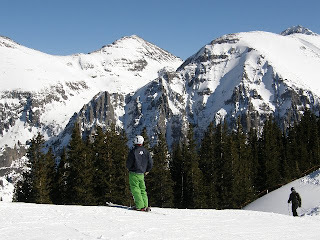 I hear that there is some snow in Placid, and I am really looking forward to skiing at Mt. Van Hoe. I will be in Vermont over the holidays, but will definitely be out skiing when I am back on the 30th...so maybe I willl see some of you out there. I will return back to Europe on January 4th. I will update you soon with my schedule, and definitely on this week's racing. And I will have lots more photos to share. My aunt and uncle, and three cousins are coming to watch this weekend, and my aunt is a great family photographer. Hopefully they you will get to see a better picture of this crfazy European racing scene. Hope all is well and Happy Holidays! Overall - a good start to the season. The Sprint race was a lot of fun and a bit more exciting for me than the Individual. I shot very well in prone, missing only one target in standing, and skiing competitively made me feel that I really can perform at this high level of racing – that I belong here. I wasn’t thinking about the end result for this race, but was thinking about the process of the race: my shooting, my ski technique, my race strategy, and what I will think in my head while racing etc. I finished in 47th place and by race’s end, I was in 56th. These numbers are important in this race because only the top 60 will continue on to the pursuit (read down below about the definition of the pursuit race.) Also, I am shooting for (ha, no pun intendedJ ) two top 50 results during this first month of World Cups. This will pre-qualify me for the US World Championship team and the competitions in PyeongChang, South Korea. Below are just a few photos. I am hoping to get some more from teammates, from today’s pursuit race. 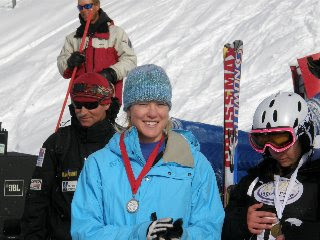 I finished the Sprint race just in time to see my teammate, Tracy Barnes, finish her race. The four of us here (women) compete individually, but in the next two World Cups we will race in 2 relays, where it will take all 4 of us together to have a good result for the US. (Sorry for the blurry photo) China wins! This is historic and I believe the first time a Chinese biathlete has won a biathlon World Cup. It makes me think about what it must be like for them after having hosted the Olympics only a few months ago and the importance their country puts on medaling in sport events. I feel very lucky to be skiing on such good snow; it is a winter wonderland here. This photo is on a run near my hotel around 11am. You can see how low the sun is in the horizon, about 3 hours before it will start to set. In the Pursuit race I started number 56th and just 2:20 minutes behind the leader. It was an exhilarating race! I had a lot of fun shooting and skiing well. Coming into the final shooting stage I was in 45th, right behind France’s top biathlete. I was a bit nervous, because in these races every second, every shot is precious. I missed my first shot, hit my second, then preceded to miss the next three. Ahh! Despite the bad last stage, I skied a competitive last loop and finished 54th to round off the first week of the World Cup circuit. The World Cup is in a different location each week, so each Monday every team caravans by bus, car and plane to the next location. On the 8th, my team and I flew from Ostersund to Munich, Germany, then took a bus to the Tirolian region of Austria. The next two World Cups are in Hochfilzen, and we will be staying in a small town lower in the valley called Fieberbrunn. I am not too far from Kitzbuhel - a famous alpine race course. Ah - I am happy to have finished my first race of the season and thank you, all of you, who watched. I imagine it might have been a bit confusing trying to figure out everything that was going on, but I hope you enjoyed watching, what is the most popular winter sport in Europe! Rank, Bib #, Name, Country, final ski time, shooting score, total shooting score, and overall time (w/penalties). The final column in the result list is the time difference from the winning time. As you were watching, all of these results were being calculated for each skier, for each lap, and after each shooting stage. To the precise second, you can know who is winning. Out on the course, coaches are standing with small computers, looking at the same information so that they can inform their athletes about their times – they can tell you that you are only a few seconds behind a certain skier, or by how many seconds you may be in the lead. Even though my result was not that great, I think it was a good start to the season. I skied technically well, which means I kept my technique clean and smooth throughout the race even though I was tired. But in the shooting range, I think I was just too relaxed. I need to find the right amount of concentration and focus on the range to hit 5 good shots at a time. Any advice? I think this weekend’s race will go well and am really excited to get back out there again. 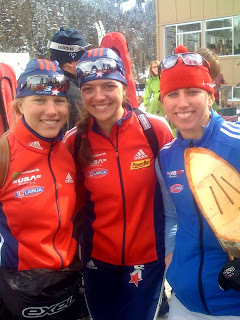 On Saturday the women’s Sprint race is at 2:30pm my time, 8:30am EST. You can watch it live again at home! 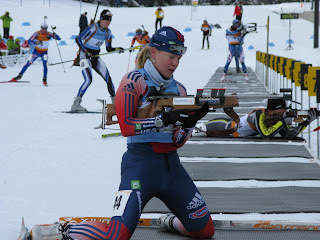 In a Sprint race we ski 3 2.5km loops, for a total of 7.5km, with 2 shooting bouts, prone and standing. For each missed target, you must ski a penalty loop. This small oval loop is right next to the range and takes about 20-25 seconds. This race, unlike the Individual, favors the faster skier. The fastest person to complete the course is the winner. My goal in this race will be to place within the top 60, because in Sunday’s Pursuit, only 60 races will start, not the entire field of 100 women. In this race, you race for every second, because everyone counts! On Sunday the women’s Pursuit race is at 1pm my time, 6am EST. This race is almost like a continuation of the Sprint. Your start time and bib number is your result from the sprint. For example, if I place 50th in the sprint and am 4:35minutes from the lead, I will start with bib #50 at 1:04:35pm. The racers in front and in back of me could be mere seconds apart, so this is a close, tight race, and really exciting to watch! Unlike the Individual, a lot of skiers will come into the range at once. It can be nerve-racking to watch (and to be a part of) because not everyone shoots the same, and you don’t know who will shoot the fastest or the best, and who will get out on to the course first. The Pursuit race is longer; we ski 5 2km loops, 10kms total, with 4 shooting bouts prone, prone, standing, and standing. For each missed target you have to ski a penalty loop. In this race the first person to cross the finish line (mål in Swedish) wins. I know it will be early – but this is a really exciting race to watch. Well, it is almost 11 am here and the sun is almost up. Seeing the sun during dark Scandinavian winters is precious, so I think I am going to go outside and stand in it. Enjoy the races and let me know if you have any questions! You can watch my race on Thursday - Live - online! I will race at 5:15pm in Sweden, which is 11:15am Eastern Time - your time. Click on "Watch Us Live"
And follow the directions that will take you to Eurovision. The beginning of the race will primarily show the most people in the start gate and the first few seconds of the race. Intermixed, will be shots of the leaders skiing and shooting, as well as shots of Ostersund. Periodically, there will be a result/status bar on the bottom of the screen that shows how the biathlete's lap and overall times compare. It will be under the lights and really exciting to watch! It is an individual race which is 15km with 4 shooting bouts - prone, standing, prone, standing. For each missed hit, a one-minute penality is added. I will recieve my bib number the night before the race and will try to e-mail to let you know. You will need two colors – one main color and one contrasting color. This is a simple snowflake design and it shows up well is you use white as your contrasting color against a dark main color. I am working on a hat, so am knitting “in the round,” which means literally knitting around the hat. If I remember right you were working on scarves, so you are knitting back and forth. On the front side the snowflake will show, but on the backside, you will see all the connecting strings from one row to the next as you switch between the two different colored strings (its going to look a bit messy, but that’s okay.) If this is your first time knitting in a pattern with another color, remember to keep the same tension and relaxed style as you do when you are knitting the rest of the scarf. Often, when you are frequently switching between colors, it is easy to loose your flow and the same tension on the yarn, resulting in stitches that are too tight or too loose. Enjoy - I’ll send you a photo as the snowflakes on my hat starts to progress. Our caterer mentioned he will try to give us a Swedish version of our Thanksgiving meal with chicken (kyckling) instead of turkey (kalkon), mashed potatoes (potatis-mösse) because I don’t think you can get sweet potatoes or yams here, and lingon berry jam (lingon sylt) because you can’t seem to get cranberries (tränbär) easily in Scandinavia either. He definitely didn’t mention pumpkin pie. But, as you know, it is not about the food we will eat tonight. This is my third year celebrating Thanksgiving with Americans in a foreign country. Because we are not surrounded by festive decorations, holiday sales on TV, and the quintessential ingredients for the big meal, The “thanks” and “giving” can shine through. I am very thankful to be here, to have this opportunity, and to be supported by so many of my loved ones, friends and community. It feels pretty good to be back here in Sweden. It is a familiar place, and except for the lack of light, it has been easy to transition this past week to the time, food, and language. The snow conditions are excellent. The tracks are mainly built with man-made snow, from snowmakers that have been running around the clock, but this morning I awoke to an inch or two of new snow. We are staying right at the venue, only a few feet from the trail. We watch people ski all day long from 7 in the morning till 9 or 10 at night. In addition to the local skiers, kids and ski-joring (skiing with a dog), more teams are arriving in preparation for the first World Cup. Out there right now, our team is joined by the Russians, Swedes, Canadians and Ukrainians. This is only the beginning, but really the World is at my finger tips on this circuit. A view of Östersund’s biathlon stadium from our apartments at noon. A defining image of Sweden that is important to convey about this time of year, is the light, or shall I say the lack of it. Recall how far north Sweden is on your globe, and how far, at this time of year away from the equator and the sun’s winter rays. The sun rises on my way to training, around 8:30-8:45am. It begins to set, and the light dims around 2:30pm, slowing setting til 3:30 or 4 when bright lights flood the trail, because by 5 its just dark. 8pm then feels like 10pm. Building the new grand stands above the stadium. The venue is also preparing for the races, setting up new stands, tents, and walkways for spectators, and working tirelessly on the tracks so that everything will be world-class by Wednesday – the opening race. I will follow up on this photo so that you can see the difference when the venue is packed and the races are on. The US Team’s wax room: lots and lots of skis, and two of our wax technicians – Andi from Germany and Gara from the Czech Republic - who take care of them, test them, and make them very fast for competitions. As the races near, I will begin to test my fleet of skate skis. I have different pairs for different snow conditions, temperatures and course, and for these upcoming races I will need to figure out which ones feel the best here in Östersund based on their ability perform in a variety of snow conditions, their ability to glide and carry speed, and depending of how soft or hard the ski surface is, how smooth they feel when I ski fast. The preparation of equipment is so very important, and this is only the beginning. By the end of the season I will know my set of skis inside and out. Your equipment becomes and extension of yourself. My teammate, Lanny Barnes, and I in our kitchen during a rest day. However, it is not all about skiing. We train for an hour to three hours a day, which leaves a lot of time remaining in the day. I have a variety of books with me, a knitting project, and spend time online writing e-mails and reading the news. We fill our time by watching movies, taking naps, eating our meals together, stretching after training, walking around town, and simply relaxing. It might sound like we can stay in our PJ’s all day, but at this point in the year we’ve completed the majority of our training and it is time to shift to racing. This means quality and low training hours, high quality rest and recovery, and most importantly, high quality racing. Its pretty simple here, this little video from my camera (its classic home video quality, hope it doesn’t make you nauseous) will give show you 1. our brown-sided, green-trimmed apartments, 2. the city’s heated water tower, 3. the biathlon range and stadium, 4. Frösön, the lake below, and 5. the trails and hardwood forest. Thanks for the visit again today! Best of luck this winter and keep in touch! I am now back in Lake Placid and relishing being back home after having been gone for a month. My training camp in Utah finished up well after the races. I got the chance to mountain bike a few times and spent some time up in the mountains above Heber Valley. The weather was exactly the same every day; blue skies, perfect 60-70 degree weather, and no foreboding fall weather in the forecasts; it made for ideal training conditions. Everything was quite pleasant really. Easy days were kept easy and were used to take a break from the shooting range, so that as we grew tired at the end of the camp, we could harness our focus for shooting and technique workouts. Looking up at the Timpanoogas, Utah. Training at a higher altitude is quite different from training at lower altitudes, and below is just a brief description of my experiences. The Soldier Hollow venue is just above 6000 ft (just a bit higher than Mt. Marcy). The mixture of gases (oxygen, carbon dioxide and nitrogen) at this level is the same as what we breathe here in Lake Placid. However, there is lower atmospheric pressure at higher altitudes. This pressure difference alters your body’s ability to transfer the oxygen you breathe in from your blood to your tissues. Oxygen is a part of an important energy producing process in your body. At a cellular level, this is how your muscles are able to “fire,” to make you jump, run, and ski. - You will breathe more heavily, so that you can take in more oxygen. - Your blood volume will increase so that you have more red blood cells to carry the extra O2. - Your heart rate at first will increase to pump more oxygenated blood through your body, but then returns to normal. In Utah, compared to Lake Placid, my body is working harder to perform each function – thus taking more energy to do the work. This triggers an increase in carbohydrate metabolism to ensure that my body is getting enough fuel for basic metabolic functions and for training. With this, my bowl of oatmeal, raisins, cinnamon, and milk in the morning over the course of the three weeks also increased to give me more carbohydrates and protein for workouts such as long bike rides or high intensity rollerski intervals. I paid a lot of attention to how I fuel my self, how often, with what, and how much. I needed to take in enough carbohydrates for my muscles to not only stay fueled, but to also replenish muscle fuel supplies after training. Basically, this means: I ate a good breakfast (as mentioned above) drank a lot during each training session, had a small PB&honey sandwich or granola bar and fruit after training, ate a great sandwich with lots of veggies, cheese and meat for lunch, had a snack before afternoon training (bowl of cereal usually), drank more during training, enjoyed a balanced dinner, and had some yogurt and cereal before I went to bed. The air is also dryer in Utah. You can feel it in your lips, skin, and the overall general feeling when you are dehydrated. So, needless to say I was drinking quite a bit of water, sports drink and getting in a lot of raw fruits and veggies to help me stay hydrated. So what is the benefit of training in Utah? Well, first of all it is a great place for the Junior, Development and National Team to train. Soldier Hollow offers a high quality biathlon venue. It just so happens to be at a high altitude. So – our coaches and staff accommodate for this and we take advantage of the metabolic changes in our bodies when we return to sea level. A temporary increase in oxygen-carrying blood cells when you return back to sea level means your body has an increased ability to produce energy. This week, I have four high intensity training sessions planned. I won’t necessarily ski faster and be stronger, but under these conditions, I will help teach my body to work efficiently with a higher heart rate, higher lactic acid production and under greater physical stress. These workouts mimic racing, when I will need to depend on my ability to perform well despite these adverse effects. There remains a myriad of changes and benefits which take a more extensive scientific explanation, so I will leave it at that and see you in class on Wednesday! Myself, Sara, Lanny, Tracy and I on a run in Utah. I introduce to you the 6th grade class that I met with this morning at the Soldier Hollow venue. I told them about Lake Placid, your class, your poster and shared with them the Lake Placid pin that I gave to all of you before I left. 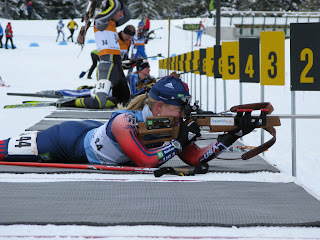 I also talked to them about biathlon, what I do for training at the Soldier Hollow venue and that my teammates and I will get to compete around the world this winter. And that we are psyched to have all of you follow us along the way. The Soldier Hollow class seems excited about learning more about Lake Placid and the Adirondacks. Utah is a pretty cool place too, so enjoy learning more about it. Each class now has each other's mailing addresses, and you both have this blog to be able to converse back and forth on. Have fun! Looking up to the 6th grade class. The men's race was after our race, and during our cool down jog (to flush out lactic acid from our legs and to help our bodies recover) we were able to watch and cheer for them. Here are a few of my teammates trailside: Sara Studebaker (Boise, ID/Lake Placid), Laura Spector (Lenox, MA/Lake Placid), Annelies Cook (Matt Cook's sister, Saranac Lake/Univ. of Utah), Denise Teela (Heber City, UT) and BethAnn Chamberlain (Caribou, ME). Sara is my roommate at the OTC, Annelies also skied for NYSEF while growing up and I have being doing biathlon with BethAnn for 10 years now! Having a solid group of teammates is awesome and definitely very important. Even though we compete individually, we train, travel, eat, live, succeed and fail together. Also, we are looking forward to creating a strong women's relay team leading into the Vancoouver Olympics. Hello! I am now in Midway, Utah and only a few minutes away from Soldier Hollow, the 2002 Olympic Venue, and our main training site for these three weeks. Gosh, was the western landscape a bit shocking after leaving Lake Placid and its glorious foliage! The mountains are mainly shrub oak (small oak bushes) and grasses, with intermittent aspen and pine groves. The cool dry air of a higher altitude (around 6,000 ft - which is just above the height of Mt. Marcy) is refreshing. These of course are some the first things I notice when I travel from the north eastern US to the west, especially since most of my day is spent outside in it. This photo is from our front door. In the background you can see the snow covered Timpanoga mountain range. And yes its snowed! We trained on Saturday while big white flakes fell. Training has been normal since I've been here - shooting, rollerskiing, running and biking. But, this week I have three races. This doesn't really change my schedule, but it has made me set a routine and goals on a daily basis so that I can be prepared to perform well. This next photo is looking down on the biathlon venue, rollerski trails and the building in the middle is the Soldier Hollow Charter school - the one I will visit on Monday the 20th. This is called the Heber Valley and on the eastern side of the Wasatch Mountains, which is home to famous ski mountains like Park City and Deer Valley. I am here almost every day (and it looks like this almost every day too!) for combo training, which is rollerskiing and shooting combined so that I can practice shooting with a heart rate. And when we are not at the venue we rollerski on local side roads or twisting roads up into the mountain canyons (like the road from Keene to Lake Placid). 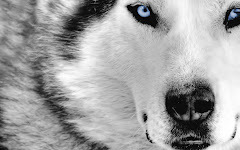 And one thing that I find different about Lake Placid neighborhoods and Midway neighboorhoods are all of the animals. These were only two of many horses throughout town that people kept in their backyards and small farms. Horses, cattle, even a herd of llamas, are all over the west. Most places you go you are driving along someone's field, pasture, or barn. For hiking and running, we then take the opportunity to get up into the mountains. This photos is from a few years ago of my teammates running in the mountains north of Park City - can you spot them running along the hillside in the foreground? The Wasatch mountain range is again the backdrop to this spectacular run. It is Friday and I am nearing the end of my training week. I have two more races this weekend; a sprint and a mass start. The sprint race is 7.5km and I shoot two times, both prone and standin. The mass start is 10km and I will shoot prone two times and standing two times. The excitement of this race is that it will be a head-to-head competition of 15 women. I am nervous, but excited! I will let you know on Monday how the races go! Monday is my day off, and typically the team will sleep in, someone will make pancakes and we'll take the day pretty easy. But this coming Monday, I will also head into the Soldier Hollow Charter school to meet Mrs. Marcy and the 6th grade class. Hope all is well girls! More stories and photos will be up in a few days. Being an athlete is all about physical strength, coordination, skill, and training. Let's call that the outer athlete. Being an athlete also reveals an inner athlete within that harbors your determination, energy levels, ability to focus, and at its heart your love for what you do. It is the eve of my second biathlon race here at Soldier Hollow. This morning I went for an easy run in the mountains above the nordic venue, followed by a yoga class in town. I have this afternoon off and will first take some time to dryfire: which involves standing in shooting position, repeating my breathing and shooting sequence, and visualizing my Sprint race tomorrow. And then, I will take some time to check in with my self. 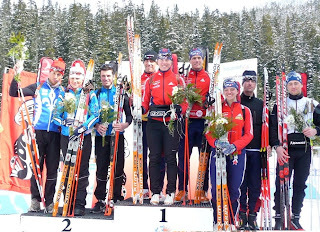 I raced yesterday, but was a bit disappointed with my shooting and my skiing performance. Tomorrow I believe I can do better - ski faster and shoot accurately. Training my "inner athlete" is just as important as training my body to ski and shoot. Tomorrow I want to be fired up and ready to go, but I also want to be relaxed, calm and focused. How can I prepare my self to do that? On a daily basis, I take the time to train my inner athlete so that I can mentally and emotionally be ready to stretch my ability to its highest potential and to confidently focus on each target, so that each one is a hit when I race and train. One way I am trying to achieve these (we are always a work in progress!) is through meditation. I am new to this technique, which takes patience and an interest in improving the way your mind thinks. Kind of like a homemade recipe - I have been tinkering with what works for me. I add a bit more time or alter that right words, like ingredients, that work together to train my mind to relax and focus. If you are wondering why I thought you might be interested in this, I have found a little excerise that might give you an idea of how you can affect your mind, body, heart and the environment around you. 1.Begin at your seats. Together, discuss the energy - the feeling of your classroom. (Is it busy or exciting, tiring or energizing?) 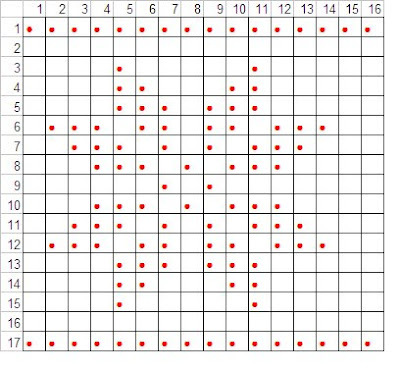 Have a recorder write this on the left side of the board in a column. 2.Close your eyes and now bring your attention away from the room and class, and to your self. What feelings do you find inside your self? Discuss: If you all feel comfortable, share some of the feelings that you found. Have the recorder draw a big circle on the board and write these thoughts inside the circle. 3.Stand comfortably in front of your desks. Close your eyes. Imagine you are a big oak tree. In your mind reach up through your spine and head like branches to the sky, stretching, and then through your core, your legs and feet, feel your roots ground you to the floor and flow deep, deep into the earth. Feel how stable you are with these two different forces. Discuss: Upon opening your eyes, discuss what you felt when you lengthened and rooted yourself. Have the recorder draw a tree with your thoughts (next to the circle). What did it feel like to grow and stretch like branches in your mind? What did it feel like to root your self to the earth? 4.Return to sitting at your desks. Sit comfortably and close your eyes. Now, how does the room feel? Discuss: Have the recorder write your thoughts in a column on the right side of the board. Then look at all of the different thoughts, feelings, sensations, emotions, and ideas you have written on the board. Did the feeling of the room and your self change throughout the excercise? Through this excercise, I hope you were able to feel a bit of your own ability to pay attention to what your mind is think and what your body is feeling. Paying attention is one of the biggest keys to this excerise and for me an important part of training my inner athlete - I need to know and understand how I am feeling and why so that I can make my self feel great and ready to handle the challenges that come my way. **I found this activity on http://www.kidsrelaxation.com/ under Past Activities. I tailored the directions to individualize this activity for the 6th grade class. Hi. Below is the photo of the ski tunnel and shooting range in Torsby, Sweden . Thank you for letting me share my trip to Sweden with you in the class room. I am headed off to Utah next, and wanted to introduce to all of you our blog and I we can stay in touch while I am traveling and you are here in Lake Placid. In this blog, along with an article, I will post photos and video like below. And at the bottom of each post there is a spot to add a comment. There you can post questions, your experiences, etc. to start a discussion. This second video is from another training session last week and shows my teammate, Laura Spector (http://blogs.fasterskier.com/lauraspector) and I (on the left) on the last climb up to the range. (You can see the roof of the shooting range at the end.) We use video analysis a lot during training to evaluate our ski technique. It helps to see what you are actually doing while you ski. Often in your head you think you must look great, when in reality you might move your limbs in odd ways that you don't even notice. Together, being able to visualize your movements in your head and have them match what your body is actually doing can improve your body awareness. This skill is key to improving and mastering the different ski techniques and your feel for the snow. Enjoy and let me know what you think of these blogs! I am training here in Sweden for three weeks with the US National Team to spend sometime at a different venue, compete, work with our Swedish coach and to spend time in a ski tunnel. (Yes, a refridgerated tunnel!) I enjoy being in Sweden not only because my family is Swedish, but I lived here my senior year of high school. Understanding the culture and speaking the language make the travel and the foriegn country much more familiar, comfortable and enjoyable. Scandinavia is known for its forest berries, and pictured below is a typical trail through forests blanketed in blueberries. Thanks for two great school visits filled with lots of skiing and snowshoeing and a fun winter of postcards, e-mails and blogs. Enjoy all that snow up there! And I will be sure to see you next March during the World Cup in Fort Kent! In the start line behind teammate Sara Studebaker (Boise, Idaho, US Dev. Team). Check out that snow huh! Busting out of the start gate. Thanks to Max Cobb, USBA's Exec. Director for taking all of these photos during the event. Getting into prone position and loading my clips. Prone - 5 bullets, 5 shots - and unfortunately in this race, two missed targets. After this stage I headed into the penalty loop. But when it does go well, this is one of the fun things that happen. I ended the year with a fun mixed relay with fellow Lake Placid Biathlete, Tim Burke (I've been skiing with Tim for 10 years now) and World Cup teammate, Jeremy Teela (Utah). Our team won the overall. 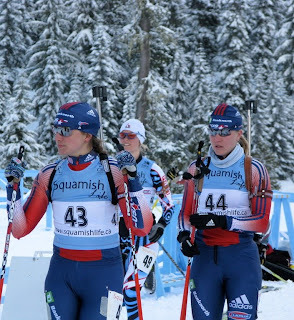 This week will round off the 07-08 season at Canadian Biathlon Championships held at the new Olympic biathlon venue just outside of Whistler. I will post some more photos and stories soon. This place is awesome and there is tons of snow!!!!!! After three long days of travel from Russia, I finally made it back to the States. This time, I am not landing in my actual home of Lake Placid, N.Y. but another one of my “homes.” Every year I become more and more nomadic and have evolved to find “home” where my favorite people and family are. If I didn’t, traveling and being away from Lake Placid would be very hard. The US feels normal of course, but the first few hours back I felt the shock of American culture. It is just bigger, louder, busier, and faster than what I have been experiencing the past few months. I did, however, just buy some Goldfish and they taste pretty good. 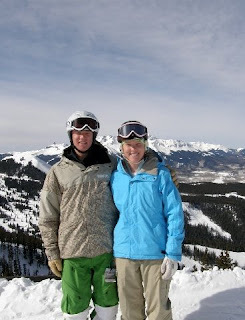 This week I will get to hang out with my brother Lars, sister Kara and Dad who live in Steamboat Springs, Colorado. Here they are while at a competition together in Telluride, CO. (I can imagine that one of them pummeled the other into a snow bank after this photo.) Both Kara and Lars compete in Freestyle Mogul skiing – better defined to as ‘bumps and jumps’ to the non-skier. They ski for the Steamboat Springs Winter Sports Club, an organization similar to the Maine Winter Sports Center in the County. Kara mid-Hele (a full spin) on the first of two jumps down the mogul run. The objective is to ski as fast as you can through the moguls from Start to Finish and to execute two perfect jumps. 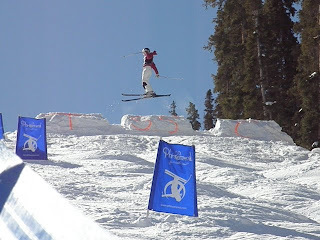 Her result is a combination of course time (speed), air (the jump) and turns (technique in the moguls), which is decided by a panel of judges at the bottom of the run. Lars and the Rocky Mountains. I’ll report back next week from Squamish, British Columbia, Canada. It is a smaller town out side of Vancouver – the 2010 Winter Olympic city. We are staying at a hotel next to the biathlon venue. That sounds normal, except that it is guarded by police and even the trails have a strong military presence. There are metal detectors at the entrance to the venue as well, and I walk through one on my way down to the wax room. Oddly, I hesitated last night when I had to walk through the detectors at the grocery store because I had bullets in the pocket of coat. Obviously it didn’t go off, but there is a different air about this place that can make you be a bit on edge. The streets outside of the venue illustrate the disproportionate spread of wealth in Khanty. In between newer tall apartment buildings there are “cabins” straight out of Dr. Zhivargo. From what I understand there is an upper class and a lower class here. And by the looks of it, there is a huge gap between the two. Traveling with the Biathlon Circuit there is a myriad of different opinions about this place and from the outside I too would not want to live here. I gladly stay within the biathlon bubble mostly because people enjoy the sport here, like everywhere we go really. It is reassuring to see people so excited and enthusiastic about their countrymen competing. The stadium erupts whenever a Russian is skiing through or shooting. And I am honored to sign the notebooks, flags and hands of kids who swarm the event – even sneaking around barriers and guards to get in to get our autographs. Just a few more days here in Russia, then I fly to Oslo, Norway, then to Munich, Germany, then to on to Denver, Colorado. 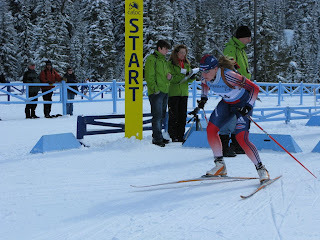 After a week visiting family in Colorado, I am off to Vancouver to finish the season with Canadian Biathlon Nationals. Lots of fireworks, dancing, costumes, celebration and even reindeer filled the stadium during Khanty-Mansyisk’s World Cup Opening Ceremonies. The main performers were kids, dressed in traditional Russian costumes. You can see in the first photos, as their presence dominated the show. Check out this quick little video of them dancing. Too bad I don’t have sound on my camera, but you can get an idea of the celebration. *okay the video is going to have to come when I am on a better connection. I am not able to upload it here. A lot of people showed up for tonight’s show, as you can see by the crowd. How many fur coats and hats can you count? I have never seen fur so fashionable, and albeit necessary in Siberia, as I have here. I missed part of the show because half way through our attention turned to an ensuing “snowball” fight between the crowd and athletes. Home-made cotton snowballs were quietly passed out. Once a few kids daringly threw them out way the crowd erupted and snowballs came from every direction. I was target at one point with one to the head and then to the back. I tried to capture the launching snowballs, but instead in these photos you can ski kids laughing and people scrambling to pick up these blue and white snowballs. The Opening Ceremonies ended up being unexpected moments of surprise and laughter, and a fun start to the week. As an athlete it can be easy, and a lot of times smarter, to stay on track and to stick to your routine. I was glad I stepped out of that for a bit tonight so that Khanty-Mansyisk could mean a bit more than just biathlon.